Just a quick check-in to let you know we made it to the Ragged Islands. We grabbed a burger at the Bonefish Grill in Duncan Town, where we have internet for the first time in a week. Cuba is about 50 miles west of here. We are now officially in the tropics and we can feel the difference. Can't wait to get in the water and do some snorkeling. We're traveling with Bruce and Marilyn Conklin; this is their third or fourth trip down here and it's a bonus to have guides in these mostly uncharted waters. Marilyn taught me how to weave baskets from Silver Palm fronds, and I'm progressing well - she said I'm her star pupil, but she probably says that to all her students. Well, more later, but it could be another week. I should have photos, too. We're sitting at Lorraine's Cafe in Black Point, using the wi-fi access Lorraine makes available to cruisers for a small donation. We're trying to get all our online work done before we leave civilization sometime in the next few days. We've decided to head down to the Jumentos Cays and Ragged Islands with Bruce and Marilyn. It's a perfect opportunity because they've been down there a number of times and it's good to go with someone who's experienced and knows the area. It's very remote and the only settlement, Duncan Town, currently has a population of only about 50 people. Cruisers who go there must be very self-sufficient because there's supposedly no place to get food, fuel, or water. That works for us; we prefer the more remote areas anyway, and love the adventure of going to a place less traveled. Snorkeling, fishing, and shelling are said to be superb, and those are favorite past times of ours. If we wait and travel at the same time as the Conklins, we'll leave Wednesday or Thursday at around 4 a.m. and go nonstop a distance of 130 nautical miles, arriving at about 9 p.m. That's the plan, anyway, and of course plans are subject to change - especially when cruising the Bahamas. 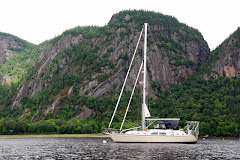 We had just anchored yesterday when Marilyn called us on the VHF to invite us to join them and another guest - Randy, whom they met cruising back in 1989 - for dinner; that was a nice treat. Dinner was fabulous and we had a good time visiting. The Conklins also have a frisky little maltese named Nemo... We really need to introduce him and Emma. We were standing in front of Lorraine's at noon when she leaned out the window of the cafe and motioned and called for us to come in. There was a TV cameraman and reporter from Bahamas National TV doing a story on Lorraine's and they interviewed us, so if you happen to be watching, be sure to look for us. Lorraine was a busy woman today: she was also catering a lunch/picnic/fundraiser for her church across the street from the school, so we and the Conklins partook. There was a choice of chicken, fish, or barbecued ribs, with peas and rice and a choice of macaroni and cheese, cole slaw, or potato salad. Guess I won't have to cook tonight, either. YES! I watched this little guy as he created a design in the sand. Wayne and I agreed on what the design looks like; what do you think? We stayed anchored on the south end of Norman's Cay Sunday-Tuesday nights. Norman's Cay is best known for its history as the base of a major drug smuggling operation, although the only evidence that remains today are bullet holes in buildings and a smuggling plane resting in the shallow anchorage near us. 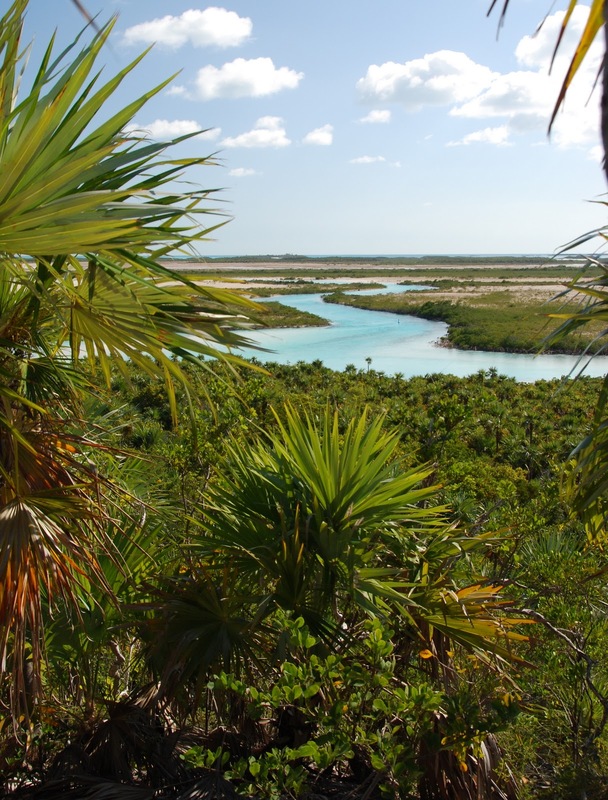 There is so much beauty around the anchorage to enjoy and so many areas to explore, it quickly became one of our favorite anchorages in the Exumas. As in the rest of the Exumas, you can't imagine more beautiful water - one can sit for hours and just gaze in awe at God's amazing creation. We wandered the sand flats at low tide in search of shells and explored to our hearts' content. Several 4-5' rays spent the afternoon lying in the sand next to our boat, occasionally swimming off gracefully to return later. 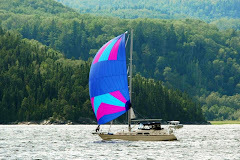 We enjoyed conversation with other boaters and invited Ed and Ann on Windswept Dreams over for drinks and appetizers. Wednesday at Shroud Cay brought rain - a much needed shower for Lena Bea and the perfect opportunity for her captain and admiral to get caught up on indoor chores. I made yogurt, baked bread and granola bars, cleaned out and reorganized the frig, etc. It cleared up in time for Chris and Candace (on Juniper) to come over for attitude adjustment hour at 5:00. Thursday afternoon as the tide was rising we took the dinghy up a windy, shallow creek to a beach on the east side of the island. We climbed up to Camp Driftwood for a lovely panoramic view of the area. We've kept in touch with Bruce and Marilyn Conklin aboard Reflection since leaving home; they are also in the Exumas and live in Punta Gorda as well. They've been awaiting a weather window to head down to the Ragged Islands. The night before last they sent us an email from Black Point saying the weather wasn't cooperating yet (Marilyn likes it really calm), so Wayne and I decided to skip on down to visit them today. We are en route as I write this. It's about a 36 mile trip and we're making good time in very favorable winds. We'll probably spend a few days in Blackpoint, which is the second largest settlement in the Exumas (after Georgetown), then continue further south for awhile before heading north to catch what we skipped over on our way down. Bruce and Marilyn coordinate Operation Bahamas Project - they collect books and school supplies and recruit boaters to deliver them to schools in the Bahamas. This year's efforts resulted in over 700 boxes of books and supplies being delivered by 50+ boats. We have 17 boxes aboard Lena Bea for delivery to the school in Black Point. Another reason it might be a good idea to head south now is the hope of warmer temperatures for snorkeling. We've had gorgeous weather, but the temperature has been in the 70's - not warm enough to inspire us to go in the water. Of course, we wouldn't have missed snorkeling in the Exuma Park, regardless of temperature, but two weeks later into spring might make a difference. Two strikes and a hit! First one got our lure, second one made it up to the boat, third one is dinner. Don't know how big mahi mahi normally run, but this one was 34 inches. 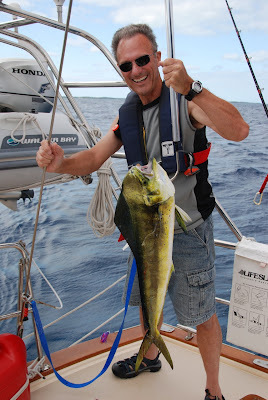 This is the first fish we've ever successfully caught from the sailboat (except for a barracuda, that is). We're grilling it and serving it with a lemon and butter dill sauce, which I've carried with us on every sailing trip with fresh fish potential since 2007 (always kept refrigerated, so it should still be good). We're off to do some serious fishing today before heading over to Norman's Cay. I hope to have photos and video to share later on, or at least a fish story. Wish us luck (we'll need it). Thinking of my brother, Brian, on his birthday. We miss you, Brian. Wayne has fond memories of 2009 in Highborne Cay... especially the seafood buffet on the beach hosted by the island caterer, Cool Runner, on Saturday nights. Wayne has been talking about it for days in anticipation, so imagine his disappointment when we found out they weren't doing it tonight because Joe had to work on a boat all day (he's also in the charter boat business). Oh, well - there's always next Saturday or the Saturday after that. I have fond memories of 2009 in Highborne Cay because this is where I swam with the sharks. There won't be a repeat performance because Mom made me promise "never to do that again," but if you want to see the blog entry with photos, check it out here. After we docked and checked in, I called Mom and was horrified to hear for the first time about the earthquake in Japan and resulting tsunamis. Our prayers go out to the people affected by this tragedy and to the country of Japan. We spent an hour making use of the marina's wi-fi, then went for a beach walk. Before returning to Lena Bea we stopped by a boat we saw on our way in that hailed from Punta Gorda, New Horizons. Of course we have mutual acquaintances. We chatted with Karen and Richard for a while and learned that Richard is quite a successful fisherman - to the extent that Karen won't let him fish any more because they've run out of freezer space. He said that this area is one of the best places in the Exumas to fish. Richard gave Wayne a few pointers and a couple lures, so we'll have to give it another try. Hey, Pat and Don - I found our first hamburger bean ever on the beach today. After a leisurely morning, a walk on the beach, and a stop at the fuel dock, we left Chub Cay around noon on Wednesday. We opted to skip Nassau this trip and anchored in West Bay off New Providence Island (Nassau is on the north end of New Providence). We cleared customs in Nassau in 2009, spent a couple nights, and also spent a night at the Atlantis (Paradise Island) Marina on our way back to FL; it's definitely worth a stop if you need provisions or haven't visited before. West Bay proved to be a comfortable anchorage and we had a good wi-fi signal, so we indulged ourselves with some wi-fi TV (we don't have satellite TV). With fairly light winds on the nose, we motored 48 nautical miles over to Allan's Cay on Thursday. Allan's Cay is uninhabited except for iguanas, and they are EVERYWHERE. Small tour boats even make excursions to the island. I enjoy watching and hearing the exclamations of the kids and their parents as they delight in the dozens of iguanas that come to meet them on the beach, hopeful for handouts. Our own kids would have gone nuts over them back in the day. Our anchorage here was calm until the winds turned to the NW during the night; by mid morning everyone else (mostly power boats) had left except us and three catamarans. We don't mind rolling a little bit and are planning to spend another night here so we can get chores done today. 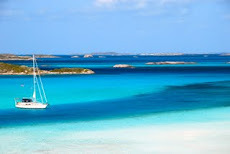 There aren't too many anchorage options in the Exumas with west winds anyway. We docked at Chub Cay around 3:00 and Wayne had to take a bus to the airport to clear us through customs. Emma and I are just sitting here waiting for him to return (we're not allowed to leave the boat until we've been cleared). I don't know which of us is more eager for a boat break, but we both hope to be taking a walk on the beach very soon! After that we'll figure out how we want to celebrate our official arrival in the Bahamas and Wayne's birthday. After making a quick run to a dive shop to replace the wet suits we forgot to bring, we should soon be on our way. Don't know when we'll next have internet access, but I might be able to post from my iPhone until we make our crossing. Conch shell blowing has been practiced in the Florida Keys for generations. Early settlers blew blasts to signal that a sinking ship had been spotted offshore, and native-born islanders are commonly called Conchs. The shell of the sea mollusk is a symbol of the island chain, also known as the Conch Republic. 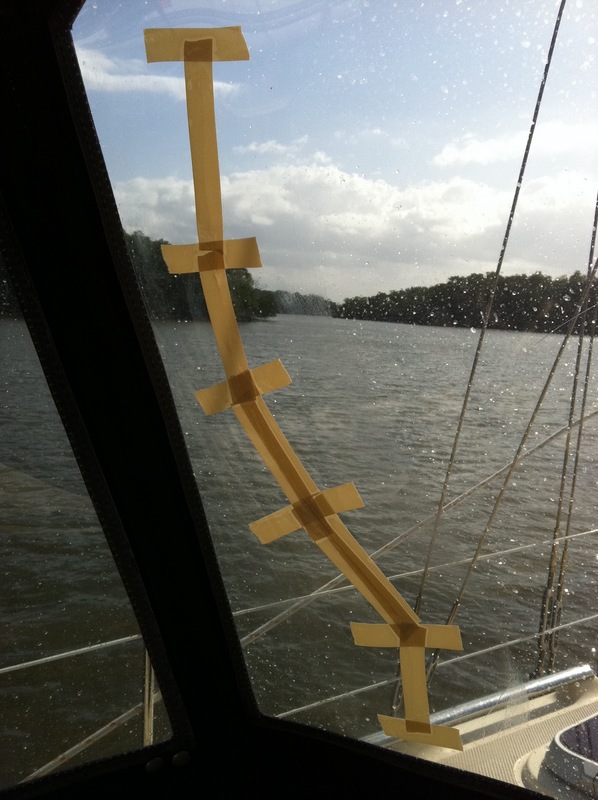 Wayne is a happy sailor today, having made his run to West Marine and replaced his anchor. He also stopped to pick up an SD card reader (which I apparently left at home) so I am now able to post photos taken with the Nikon. We've started to make the transition to island time by spending another night at Marathon. It's nice to have a leisurely day to get things done and not rush off. I've been able to get things done that would have been impossible to do in the seas we've had since leaving home. 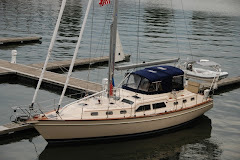 I made bread and yogurt this morning - the two items at the top of my list - and did lots of miscellaneous boat chores. I'm also trying to make the most of the strong, free wi-fi signal we have here; it may be a while before we have that again. ... it takes a village half an hour to dock a boat. 'Nuff said about that. Anyway, greetings from Marathon Marina in the Floriday Keys. Yes, we're actually docked here. 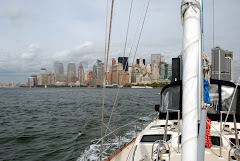 We intended to pick up a mooring ball at the city dock, but they were full and had a waiting list. Wayne needs to make a West Marine run tomorrow - he was THRILLED to find out that they carry his Rocna anchor and sees it as a sign that things will start going more in our favor. He also needs to get parts for a winch that broke today. As for me, well, we've been having battery issues (resulting in "power" struggles with my husband) and I plan to finally bake some bread in the morning. We had perfect sailing again today, averaging well over 8 knots and often up to 9. It turned out to be one of those days where it wasn't safe to move around the boat. I never thought our cockpit enclosure would fail to keep us dry and protected from the sea, but today we had many waves crashing over the top of our enclosure and we were WET. The force was even enough to cause a major crack in our dodger (windshield). We headed in to Little Shark River - a lovely, peaceful anchorage on the edge of the Everglades where we chose to spend the night - only to discover that we had lost our primary anchor. Ok, well, that's why we always have a spare. Except Wayne was particularly fond of THIS anchor (a Rocna anchor) and quite distraught about losing it. There are other boat issues that I won't bother to mention, but THAT'S BOATING, FOLKS! We finally got underway yesterday at 3:45. Whew! It feels so good to be done with preparations and able to just relax and enjoy the journey. We anchored in Charlotte Harbor last night, just happy to be away from our dock, and today we made it down to Marco Island, where we're anchored off the beach for the night. Perfect winds had us going about 7.5 knots and sometimes up to 8.5.